UNITED NATIONS, Jul 18 2012 (IPS) - When South Korea inaugurated a U.N. Office for Sustainable Development last October, the new research and training facility was designed to help the world’s poorer nations “accelerate economic growth, improve quality of life and protect the environment”. And nine months later, after showcasing the protection of marine ecosystems at its international exhibition Expo 2012 in the coastal town of Yeosu, the Korean government is in the process of transferring advanced technologies to the developing world. The countries benefiting from the ‘Yeosu Project‘ include Fiji, Tuvalu, Nauru, Vietnam, the Philippines, Indonesia, Guatemala, Sri Lanka, Tanzania and Grenada. Ju-hoon Ahn, deputy director, Overseas Management Division of the Organising Committee for Expo 2012, told IPS the Yeosu Project is a grant aid programme to provide R&D (research and development) and training and education programmes to developing countries. The aim is to address the urgent challenges faced by oceans and coasts – in line with the theme of Expo 2012. For example, she said, “We helped Guimaras Province in the Philippines develop a framework for the provincial Disaster Risk Reduction and Management. The ongoing projects include case studies such as “The Climate and Ocean in Vietnam – Integrated Management of the Shrimp-farm and Mangrove Forestry in the Southern Mekong Delta” and strategic help such as “Marine Ranching Project” in the South Pacific Islands. The Korea International Cooperation Agency (KOICA), a government institution that manages the country’s international assistance programmes, has been commissioned to implement the Yeosu Project, a spillover from Expo 2012. The Korean government has earmarked 10 billion won (about 8.7 million dollars) for investments in pilot projects through 2012. Thirdly, cultivating the marine industry, including projects related to environmentally-friendly fishing technologies, restoration of fish species, cutting edge farming techniques, port logistics technologies and marine equipment. 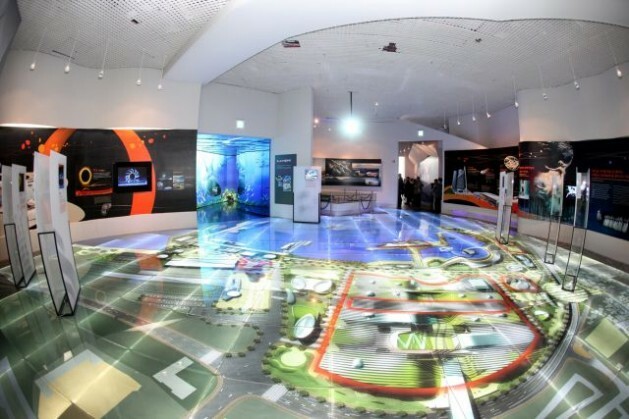 In May, Korea launched Expo 2012 in a sprawling Disney-like park in Yeosu which, among other things, has highlighted the achievements of the 21st century in marine science technology. The exhibition, which has drawn hundreds of thousands of visitors since its opening May 12, is scheduled to close Aug. 12. With a projected budget of 1.9 billion dollars, the exhibition includes a marine forest aimed at restoring eco-friendly fish farms, a large-scale sea water desalination plant, and buildings powered by solar power and ocean thermal energy. These advanced technologies will eventually be transferred to the world’s poorer nations battling marine pollution, climate change and rising sea levels. A longtime developing nation, South Korea is one of the few countries to graduate to the status of a developed country (along with Mexico and Chile) switching its role from an aid recipient to a donor. Meanwhile, the U.N. Office for Sustainable Development (UNOSD), a joint effort of the United Nations, Korea’s environment ministry, the city of Incheon and Yonsei University, is based at the university in Incheon. The Office will be managed by the U.N.’s Department of Economic and Social Affairs (DESA) and will serve as a training and research institution, and a centre for pooling sustainable development knowledge, according to the United Nations. Sha said that in the longer term, the new office will contribute to advancing the implementation of the outcomes of the Rio+20 Conference which took place in Brazil Jun. 20-22. He said the centre will also organise training programmes for national representatives and major groups from developing countries to advance the sustainable development agenda.